A Quick guide to Block Email address in Gmail and get rid of any Spam sender. 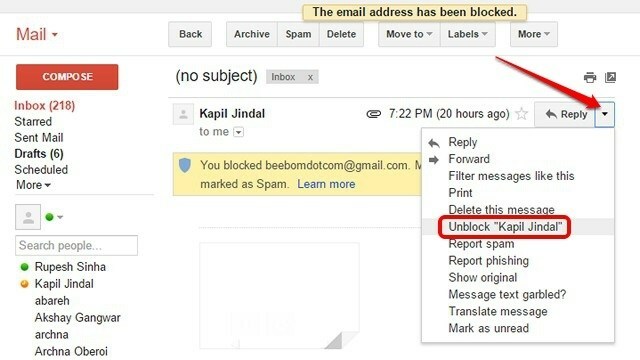 Step-by-Step Instructions with Screenshots For Gmail users, follow these tips to block unwanted emails in Gmail account. If you are getting emails you do not want in your inbox, you can block or unsubscribe from the sender, or report the message to Gmail. When you block a sender, messages they send will go to your Spam folder. In the top right, click More. You will stop receiving emails from this person. If you have blocker’s remorse and want to hear from your contact again, follow these steps. Click the gear Settings icon on the top right of your inbox. Tap the Filters And Blocklist link. Click Unblock at the end of the row of the sender you wish to reinstate. If you signed up on a site that sends lots of emails, like promotions or newsletters, you can use the unsubscribe link to stop getting these emails. Open an email from the sender you want to unsubscribe from. Next to the sender’s name, click Unsubscribe or Change preferences. If you don’t see these options, follow the steps above to block the sender or mark the message as spam. Note: It may take a few days for the mailing list to stop sending you messages after you unsubscribe.